Welcome to my quarterly newsletter and thank you for your interest in my work! 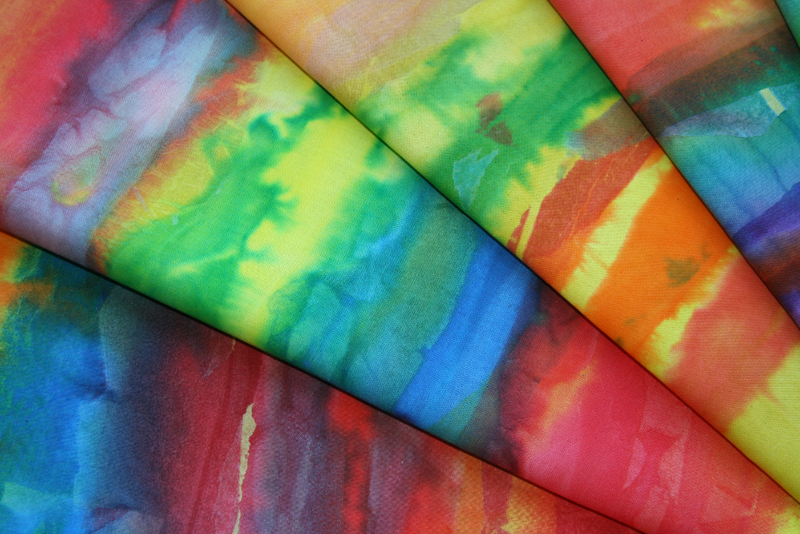 It’s Summer time here in New England and that brings perfect days for sun printing on fabrics! I’m excited about a brand new piece that I am working on that combines my Layered Waves topstitching technique, raw edge collage, a splash of metallic foil and of course my tissue sun printed fabric. This Summer I’ve made the big step of setting up my own YouTube channel with my first two videos. 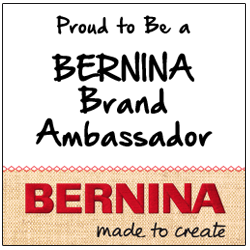 I’ve also moved into the 21st century with the one year loan of the beautiful BERNINA 770 QE (Quilters Edition). So many exciting things to share with you! 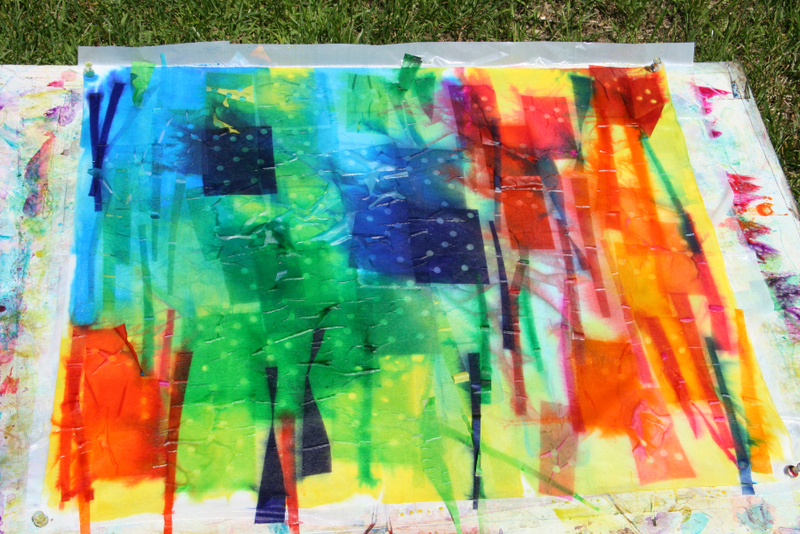 Join me as I share sun printing with color tissue paper on my very first Youtube. 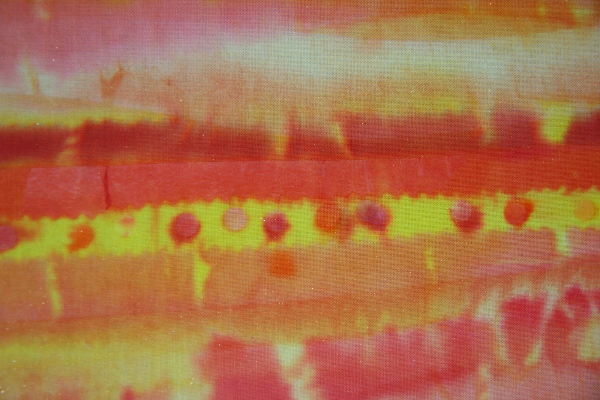 It’s a 20 minute workshop that picks up from my article on Sunprinting on fabric in the Quilting Arts magazine (June 2006). After we filmed the video I made another batch of sunprints using my pinking scissors and hole punch to create some interesting effects. Are you too far away to take a workshop with me? 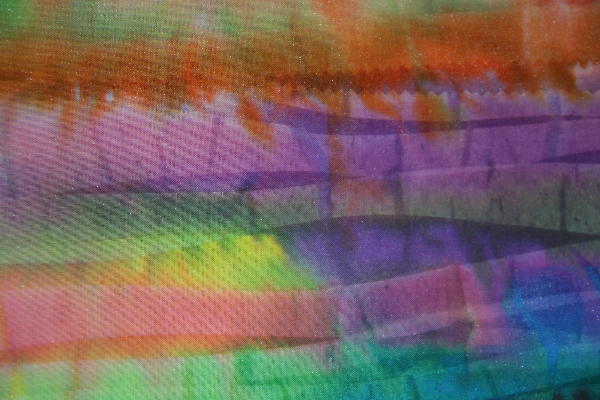 Here’s a great introduction to the concept of creating a landscape “accidentally” with strips of fabric. 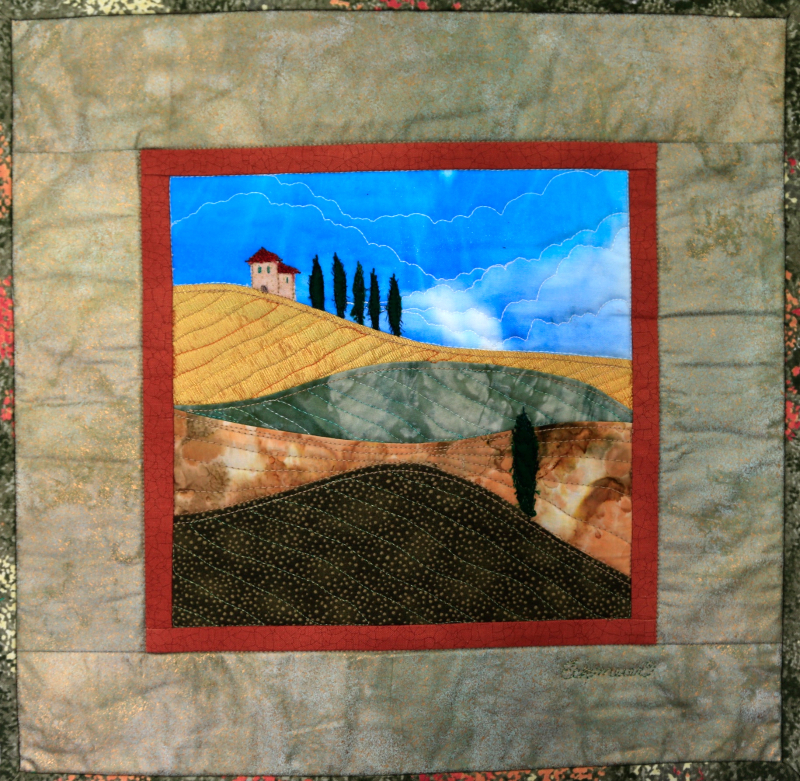 In this 10 minute mini class you will learn how to create an Accidental Landscape inspired by the beautiful scenery of Tuscany. Here are the subjects for my upcoming YouTube videos. Subscribe to my channel and be the first to see these videos the very minute they are posted. If you have a suggestion or an idea that you would like me to present, please send me an email. I want to offer creative ideas that are helpful to YOU. My mechanical BERNINA 1031 is jealous of a newcomer in my studio! 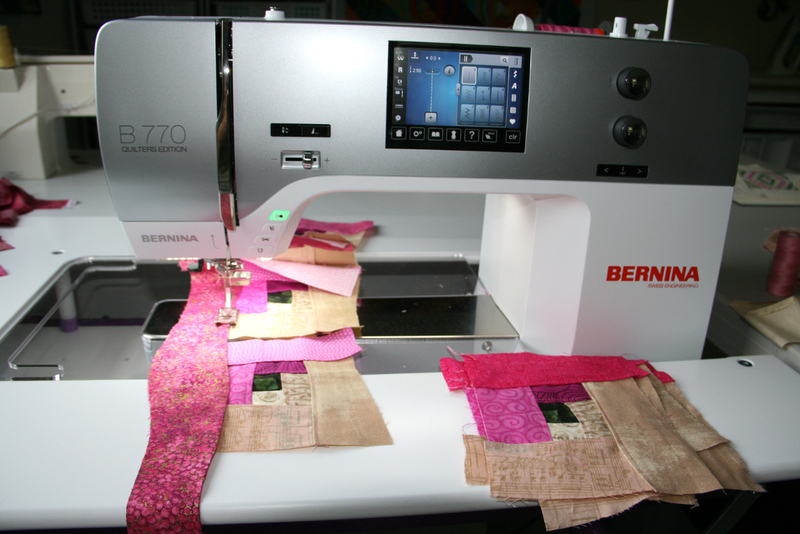 It’s the new BERNINA 770 QE (Quilters Edition) on loan for a year. For 18 years my mechanical home sewing machine (1997) has served me well. I did all of the free-motion quilting of my internationally award winning quilts on that little baby. So it was a HUGE step for me to even consider a change. The lure of a bigger quilting space and the option of the stitch regulator finally got my curiosity. How much do I enjoy this machine? Let me count the ways for you! Read on for those who are interested in the features I can no longer live without and how easy it was for me to move from the stone age of my mechanical machine to a highly sophisticated computerized machine of the 21st century!! It also helped that Lisa, the owner of Pins and Needles in Mt. Kisco, NY, was my knowledgable and patient teacher. Thank you Lisa! Needle threader - time and stress reducer! 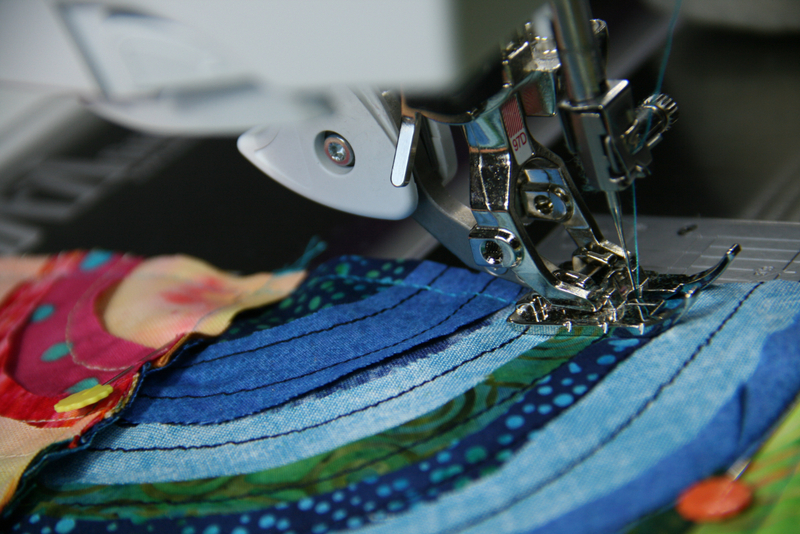 Press the “scissors” button thread cutter – what’s there not to love? Huge bobbin – lasts 3 hours of non-stop quilting and winds in 20 seconds! Bright Lights – I can see again without the aide of a clip-on light! 6. Built-In Walking Foot, that is also the ¼” foot – not bulky – nice and trim. Here’s a photo of the 97D foot. I am using it here to piece, since it helps with the bulk of my topstitched layers. 8. Needle Down Option – much easier than using the back of my foot pedal! 9. Large area to quilt – what a pleasure not to have to fight with fitting the quilt into a tight space – my back and shoulders can relax now! 10. BSR – BERNINA Stitch Regulator – rumor has it that this will slow you down. Well… I must be a slow quilter, because the machine wants to quilt faster than me! I like this feature for in-the -ditch quilting. 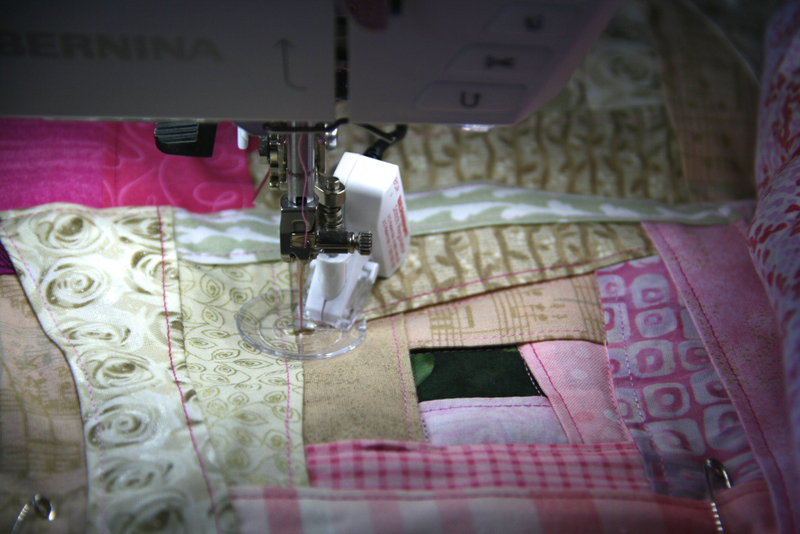 I quilted an entire quilt using this foot and here you can see the Layered Log Cabin in the process of being quilted. The BSR has 3 options for feet, this one in the photo above is perfect for the topstitched curves, because it doesn’t get caught in the little topstitched pleats. WOW, that quilt was finished so quickly! Since I have been free-motion quilting for 18 years, I still prefer to quilt under my “own power”, however as you can see, I like the option of using the stitch regulator for specific applications. 11. Needle/Plate Info- now I don’t have to guess what needle I have in the machine – the machine saves that info for me and it let’s me know which plate is appropriate. The list above will continue to grow as I explore new features to incorporate in my work. New projects will be available on WeAllSew.com as soon as I make them! From the quiet grays and soft greens/blues of my last quilt, River Stones, I have switched gears to bright intense purples, teals, reds, oranges, pinks and yellows. I’m using topstitched curves, fabric collage and a little bit of metallic foil to create happy little “sunshine flowers,” which are half in the sun and half in the shade. I just finished basting this quilt with Fairfield’s American Spirit: Bamboo/Cotton blend batting. 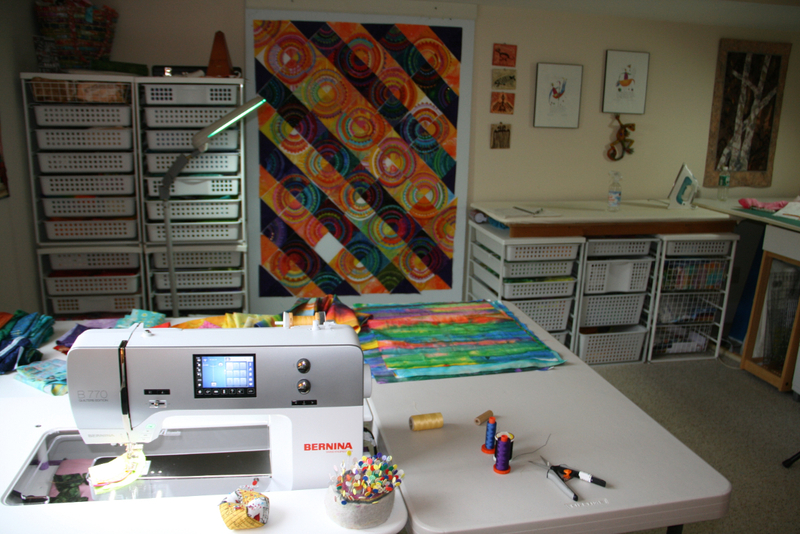 It will be the first art quilt that I free-motion quilt with the new BERNINA 770QE. In the close-up photo you can see the sparkle of the metallic foil. 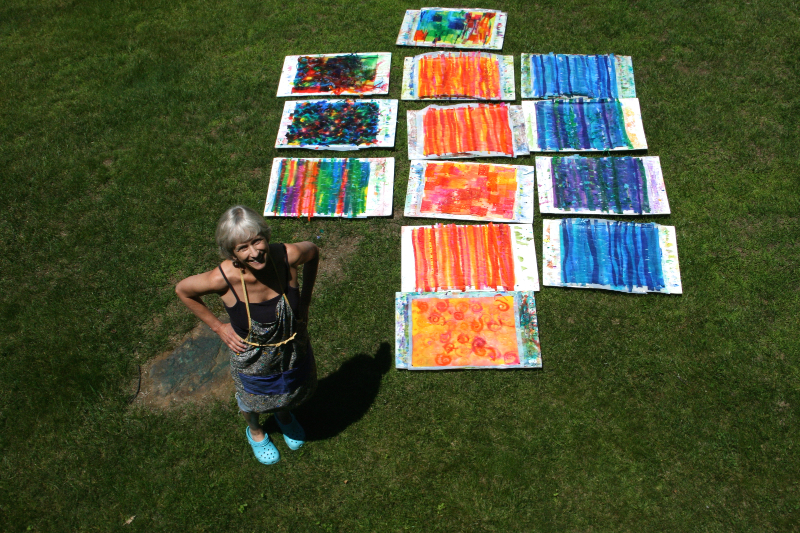 The photo on the right shows my studio. If you look closely you can see that I am working on the LAST block. It’s under the presser foot and will fill that missing white square on the design wall. Yippeee....it took me 2 months to topstitch those blocks! Notice the recent tissue sun print fabrics in a pile to the right of my sewing machine, where I can enjoy looking at them. I used one of the blue tissue sunprints for the borders. What kind of needle do you use to baste your quilts? I use a John James long darner #9, which is great for my collaged pieces, however, my layered topstitched quilts have a few more seams to get through, which either break my basting needle or bend it into an unusable angle and hurts my fingers in the process! 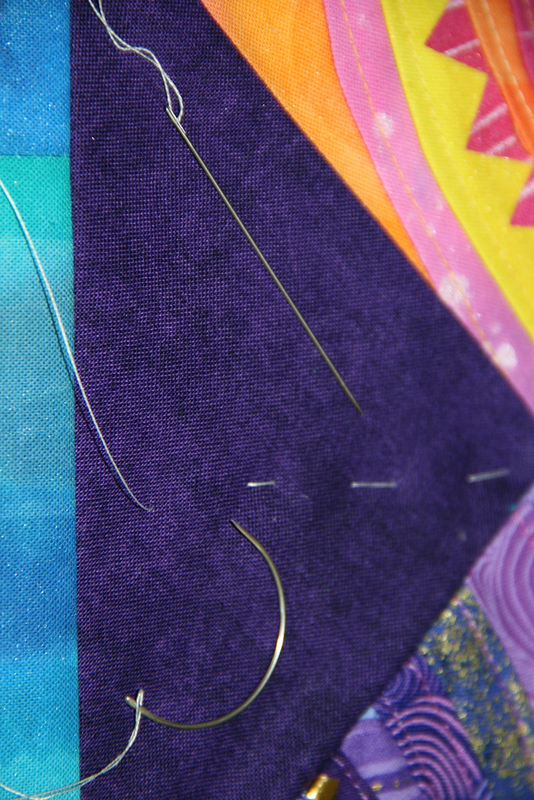 My solution is to use the curved hook needle that is often used to tie quilts. It goes in and out of the fabric with very little effort on my part, which makes me very happy! 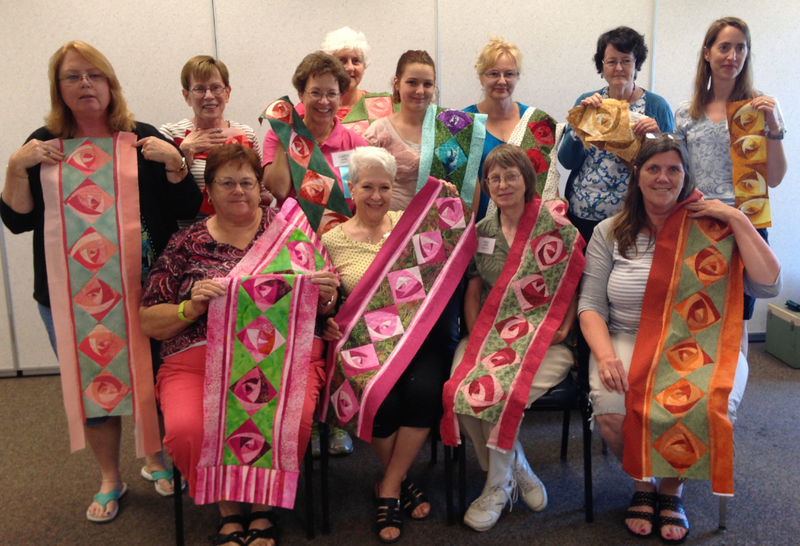 My recent teaching trip to the Vermont Quilt Festival was super. It was great to have a reunion with many friends I had not seen for years and it was a treat to meet lots of new quilting friends. I’m looking forward to meeting guild members in Franklin, TN and Alpharetta, GA in the beginning of August. My travels continue in the Fall with two trips to CA, NY and TX. I have been notified by the Pacific International Quilt Festival in Santa Clara that my Random Roses is FULL and that Seaside Villages has one or two spots left. Good news is that Wild Waves for Women (aka Let’s Make Waves!) still has openings. So if you are free and interested in learning an extremely versatile technique, please get online and sign up to make some wild waves with me in California!! For those of you who like to plan ahead, I have included my 2016 teaching calendar. 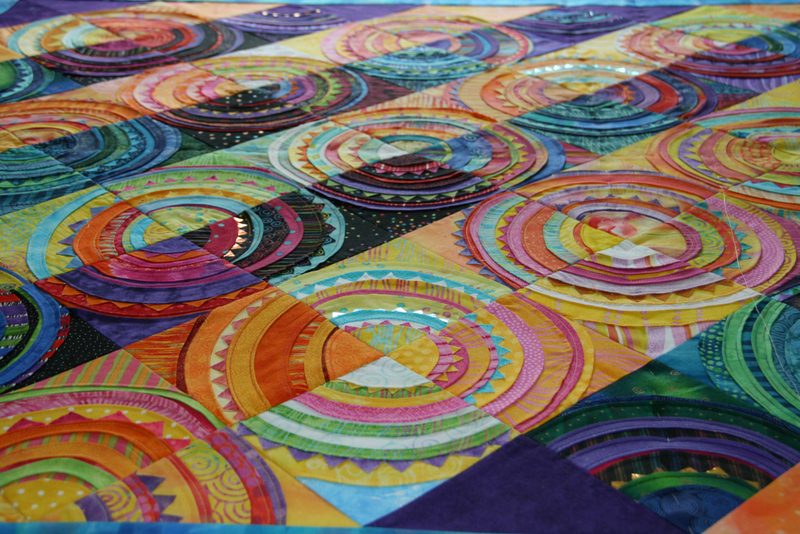 The year will kick off with Quilting in the Desert in Phoenix, AZ in January. Here’s a great opportunity to take a 2 day Happy Villages workshop and an in depth 3 day Wild Waves workshop. 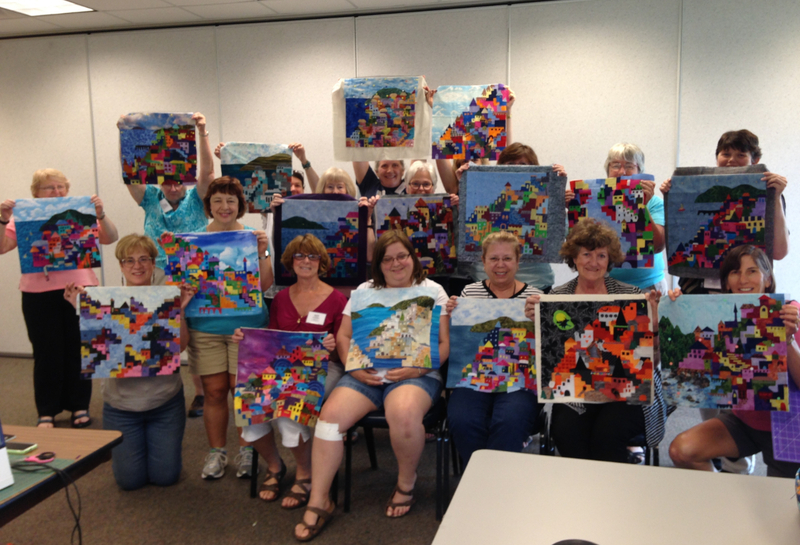 Here are my fantastic students from two of my workshops at the recent Vermont Quilt Festival. On the left is the Random Rose workshop, where we made Rose Runners. On the right are wonderful Happy Villages created be even happier students. 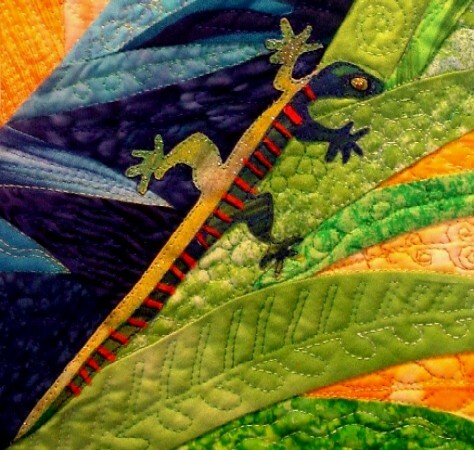 Copyright © 2015 The Quilted Lizard Fiber Art Studio, All rights reserved.